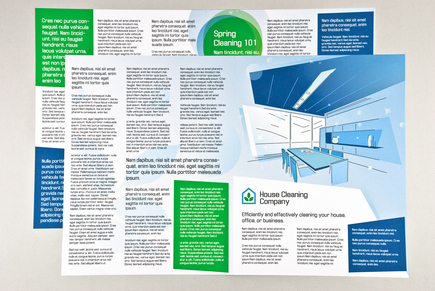 This sleek, graphic newsletter design can be used for a company specializing in cleaning services for home, office, and business. This newsletter would be perfect for the company to give an overview of services, and also to give some quick cleaning tips. The graphic, blue elements give the newsletter a cleanly, hygienic feel.